Cato Berntsen Larsen has done what no friend does in help. 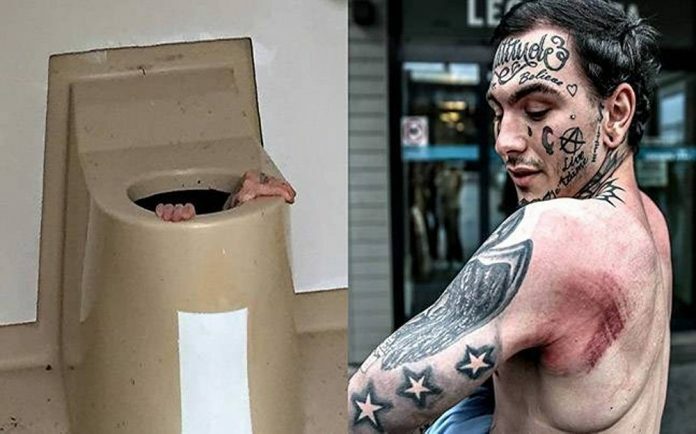 The tattooed Norwegian has all climbed into the public toilet tank to rescue his friend’s phone.According to the reports, the Norway Man named Larsen Stucks in Toilet Trying to Get Dropped Phone Back. Larsen’s friend dropped his mobile phone in a public toilet while urinating. He called Larsen for help and asked him to get his phone because he was slim enough. The toilet is an old fashioned one with no sewer connected to it. It contains a large tank underneath which will be cleaned once in a year. He contacted the fire brigade for help to get him out of the toilet. They sent a four-member crew and demolished the toilet to bring Larsen out. 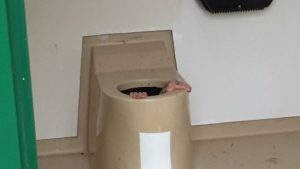 “We received an emergency call at 07:58 AM, regarding a man stuck in a toilet tank. We sent a fire truck with four men to the location. It took them about ten minutes to get the man out. The fire personnel had to demolish the toilet. It is now out of service”, said Kristin Rodnes at Vestviken emergency central. The firefighter’s team worked for 10 minutes demolishing the toilet and saved the young man.Larsen has sustained injuries to his upper arm and reported that he was bitten several times. He was treated at the local hospital giving antibiotics. However, the phone was not recovered.